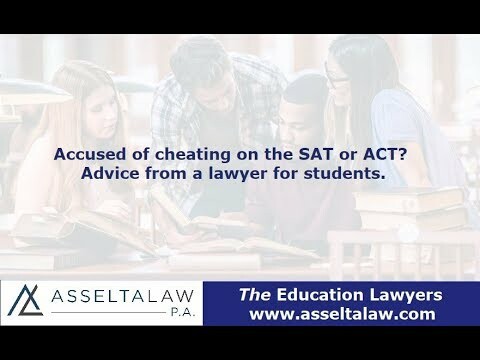 What happens when you or your child is accused of cheating on the SAT or ACT? There are usually a couple of ways this happens. In the middle of the test, the proctor comes over and believes cheating was occurring. Either they are looking at another students answer sheet or brought in outside materials. At that point the proctor will confiscate the exam and report the student to either the SAT or ACT board. If there is a really big increase in score, 400 plus points on the SAT or 6 or more points on the ACT. This could cause a cheating accusation. If your Scantron sheet matches with someone else's in the testing room, you can be suspected of cheating. Additionally, wrong to right answer erasures could also flag you for cheating. What should you do if the SAT or ACT board believes you cheated? There is an appeal process. It is time limited and can be challenging. You have to act quick to preserve evidence that supports your side. I strongly recommend that you speak with an attorney experienced with these types of appeals. Can you help me write my appeal? Yes. I utilize my nearly twenty years experience to craft successful arguments for appeals. I work with students all over the country facing not only accusations of cheating on standardized tests, but also in college. Don't let a cheating accusation threaten your college dreams.